I was invited to give several talks in Osaka and Tokyo about openEHR and eHealth at large last week. This was made possible by my fellow Dr. Shinji Kobayashi who chairs the openEHR Japan and Professor Hiroyuki Yoshihara – heaps of thanks to them. I was fascinated by the country, the scale of everything was big and fast compared to tranquilising New Zealand – kind of Big in Japan! A very sincere and hardworking society and extreme cleanliness everywhere. I was also surprised to see the interest in openEHR by quite a few people, from academics to vendors – thanks to Shinji and others who have organised various awareness and training activities in the past. Also invited was Jussara Macedo-Rotsch, a director of openEHR whom I had the joy of meeting in person for the first time. Internet is a funny thing I felt like I knew her for ages. The first event was a pre-conference tutorial on ISO 13606/openEHR; where Jussara presented clinical perspective and modelling, I presented the technical and implementation aspects (prezo here) and Shinji also touched on implementation but focussed on localisation. I must confess, as the lead of Localisation Program, I was astonished by the many challenges posed by the Japanese locale which was extremely well put by Shinji. Second was a workshop on EHR implementations around the world in the afternoon. I was pretty excited to meet and present with John Halamka who spoke about the EMR adoption in the US and meaningful use targets (here’s his reflections from Osaka from his famous blog). Jussara presented Brazilian eHealth strategy and EHR architecture. I presented basic facts about the New Zealand health system and eHealth approaches by giving practical examples from various systems in use here. I also covered the recent Interoperability Reference Architecture and how we plan to use openEHR to create a uniform content model for the health sector (prezo here). There were a few Japanese speakers who talked about eHealth approaches and projects. Third event was in Tokyo – a private seminar targeted for more ‘business/vendor’ type audience. John Halamka (via videoconference as he had to return back to Boston), Jussara and I presented – quite similar topics to the workshop in Osaka (prezo here). I was knocked-out to see the interest in New Zealand’s profile and excitement from the audience on openEHR. In between the events we had a few days off and on the way to Tokyo we visited Mount Fuji and my wife and I did the epic Mt. 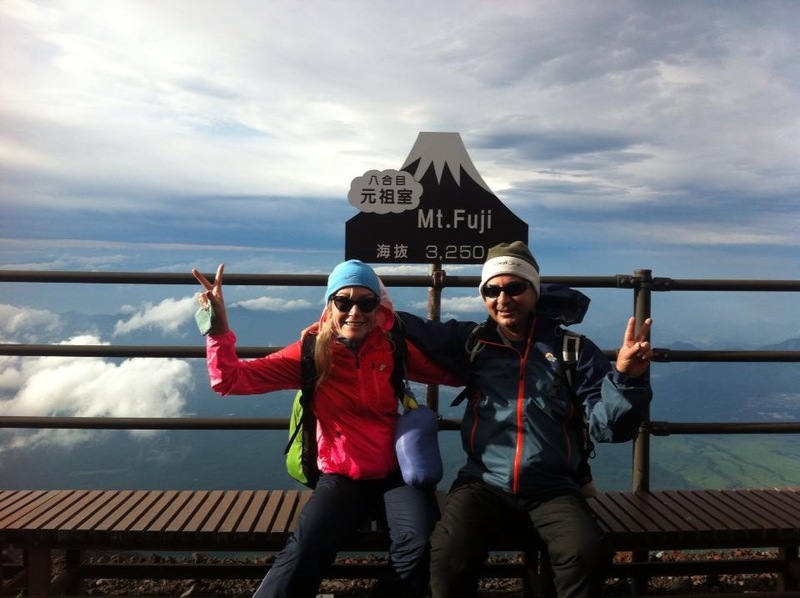 Fuji climb! Here’s the evidence!